I hate construction zone cones and barrels. I realize hate is a strong word. But truly I do not like them. I always feel like at any moment I could accidentally take one out with my minivan. Maybe this is because driver’s education was taken out of my high school due to budget cuts. So, my Dad decided to be my sister’s and my driver’s ed teacher. He took his job very seriously. First, we had to watch driving safety videos from the dark ages–a time when they may have still been having to use a crank to start the cars. Then we practiced in the driveway. FOREVER. Then we finally hit the big stuff. We moved to the state park in our area. I think it was a year of driving before I realized you could go over 15 MPH. But my favorite most hated time was the parking practice time. My Dad set up construction cones with rakes sticking out of the top for my sister and me to practice parking in the lines. This park happened to be where all of the cool kids hung out on the weekends–all the cool kids who were not having their own driver’s education class complete with cones and rakes. My Dad and I joke about this all the time because I am still terrible at parking. When you are driving somewhere and you get to a sign that says “Roadblock,” it is easy to wonder what is going on behind that sign. Usually, you have to detour or turn around. Roadblocks are generally set in place so that you do not pass. We hit roadblocks in our God-sized dreams. Those times when the doors seem to slam shut. When the resources seem to dry up. When the dream seems so big and our abilities seem so small. When we don’t get the agent that we thought would love to take on our writing. When the speaking engagements are not coming in. When the demands of our family seem to live little time for our dream. Roadblocks do not have to mean the death of a dream, they can be the construction zone for a dream. I believe that when we hit roadblocks, God is working behind the scenes. He is constructing or reconstructing our dreams for His purpose and His glory. He may be smoothing out the potholes. He may be repaving some areas from our past that have become rough and bumpy. He may be building a whole new road. Friend, can I encourage you to not give up when you hit the roadblocks. What God is doing in the dream construction zone is important to the building of your dream. God wants to use you and your God-sized dreams as a signal of His glory. Sometimes that means a time of construction or reconstruction. 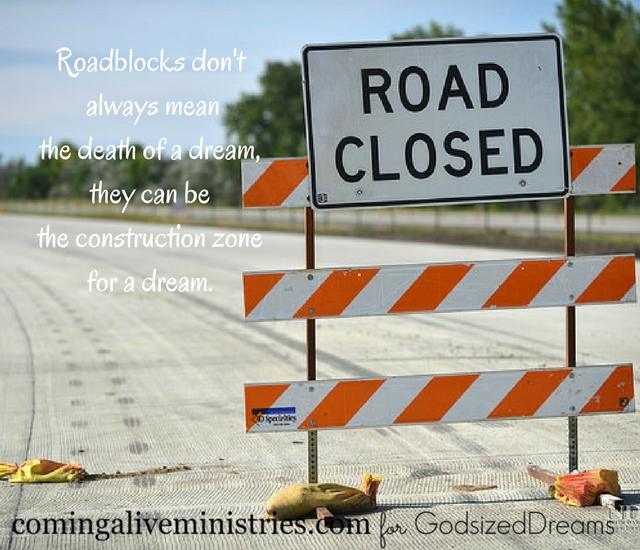 In what ways have roadblocks been a time for God to do some construction work on your dream? Jenn Hand is a strong coffee drinking lover of Jesus. She has a zest for life and loves to go on adventure with Jesus around the world – often getting lost somewhere along the way! Jenn has been professionally speaking since 2004 and became the Executive Director and founder of Coming Alive Ministries in 2012. She spent two life changing years overseas in South Asia as a missionary and has traveled to many third world countries to share the love of Jesus. You can find Jenn on Twitter, Instagram and Coming Alive Ministries.